On April 27 the Vella Gulf stopped at Haifa, Israel, for Holocaust Remembrance Day. 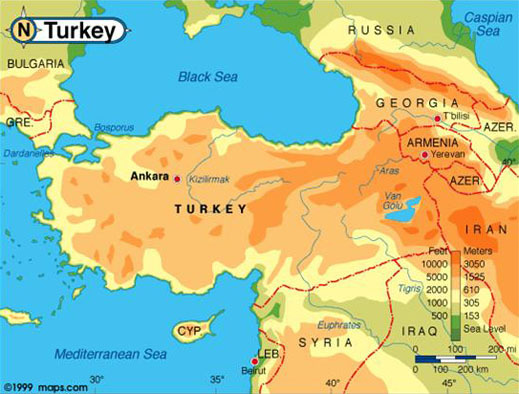 A Russian report claimed the Vella Gulf would enter the Black Sea on May 9, citing “a military diplomatic source.” That’s code for the system of notification of intent which non-Black Sea states are required to provide the Turkish authorities for their warships under the 1936 Montreux Convention. A maritime source says these notifications usually are issued 24 hours and up to 7 days around the scheduled date. A published Navy report claimed that on May 14 the Vella Gulf was operating “forward in the Mediterranean”, while sailors on board practiced shooting their pistols and rifles. 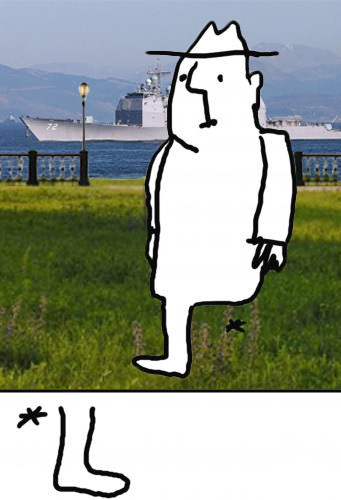 The Turkish Navy and ship-spotters in Istanbul confirm daily foreign navy movements through the Dardanelles and Bosphorus Strait, heading north into the Black Sea and south into the Mediterranean. As of dawn May 16, the shore cameras had snapped the movement of French and Russian warships. 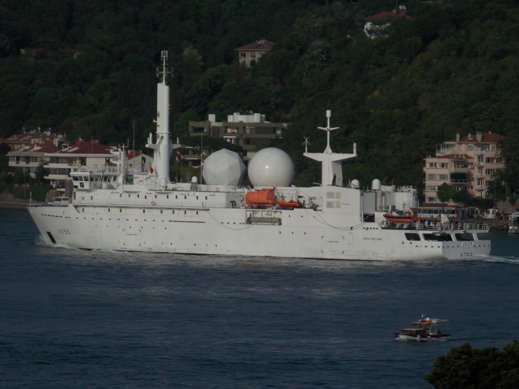 The French signals intelligence vessel Dupuy de Lôme (below) was steaming towards the Black Sea for a fresh tour of action; it was also in the Black Sea between April 11 and 30. For that operation, click. On May 15 two Russian Navy landing ships, Olenegorskiy Gorniak and Kaliningrad, were recorded sailing south. The first is normally part of the Baltic Fleet; the latter of the Northern Fleet. They were despatched to Crimea at the start of March, where each reportedly unloaded 300 troops and 20 armoured personnel carriers or other vehicles. So far this year, the Turkish ship spotters have recorded the Kaliningrad sailing south four times, north twice. The Olenegorskiy Gorniak (below) has been operating more normally, northward voyages matching southward. The ship spotters appear to be missing some straits movements during dark. Unless the Vella Gulf has slipped past Istanbul at night – there was a full moon in a clear sky on May 14 and 15 – the absence of a record of her passage means either the Vella Gulf has successfully tested the latest in stealth technology; or it has been delayed for technical reasons; or else the US Navy has decided not to deploy her for the time being. 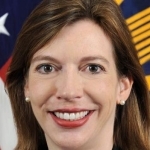 On May 6 the US Deputy Assistant Secretary of Defense, Evelyn Farkas (right), gave testimony to the Senate Foreign Relations Committee, itemizing what she called the “prompt and high-profile steps to re-assure NATO Allies in light of Russia’s incursion into Ukraine.” She started her itemization with “bolstering our maritime presence in the Black Sea with the USS Donald Cook, USS Taylor, and an extension of stay for the USS Truxtun.” Farkas made no mention of future naval moves, nor of the decision to send the Vella Gulf into the Black Sea. The decision and the vessel are overdue.